We have been loving the series ABC Monsters. In the all new volume 5 - Rainy Day Raffle in Capitol Castle we explore the letters Q, R, S, T, U. This year we have a kindergartener in our homeschool. I've been having him watch these DVDs as a supplement to his phonics lessons. It is a great way to add a fun element to our school time without always being stuck at the computer or in a workbook. He likes the cute stories and adventures finding the ABC Monsters. Twenty six cuddly ABC Monsters live within the walls of Capital Castle. Each monster represents a letter of the alphabet, but should any of the monsters go missing for longer than a day, all the letters will be wiped clean from every book in Capital Town! 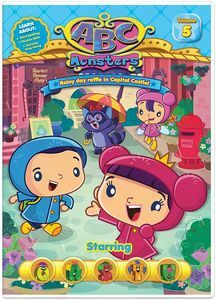 In this DVD, embark on adventures with Alice, Brian and Cherry Berry to search high and low for the letters Q, R, S, T, and U. It's a rainy day at Capital Castle. The big Capital Castle raffle is supposed to happen today but it has been canceled! The raffle is to be held in Alphabet Garden but with all this rain there is no way the raffle can happen. To make matters worse, now R-Monster has vanished from Alphabet Garden. Will they find her in time and be able to still have the big Capital Castle raffle? Find out as Alice, Brian and Cherry Berry search for R-Monster and meet a few friends like Ricky the Rabbit and Rachel the Raccoon along the way. Get set for a spellbinding series of magical adventures that engages preschool children's imaginations, while making learning exciting and entertaining. One lucky reader will win a copy of ABC Monsters Vol 5! My young nephews will watch this with me when they stay over.